Garrison, Mark B. 2017. 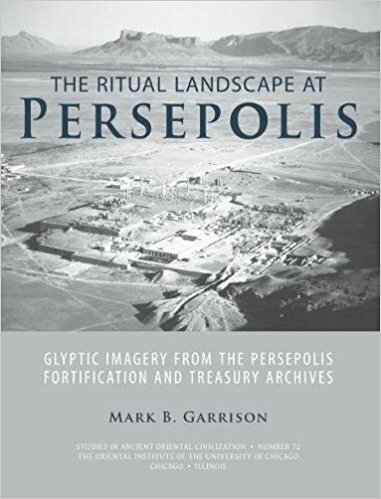 The ritual landscape at persepolis: glyptic imagery from the persepolis fortification and treasury archives. (Studies in Ancient Oriental Civilization 71). Chicago, IL: Oriental Institute of the University of Chicago. There are, perhaps, no more contentious issues within the study of Achaemenid Persia than those surrounding its religion(s) and religious iconography. Owing to the role that fire plays in Zoroastrian beliefs in later periods in Iran, almost any discussion of the subject of Achaemenid religion will eventually turn to the identification of sacred fire, fire temples, fire worship, and fire altars in the archaeological, epigraphic, and literary records. The focus of this book is a corpus of glyptic imagery preserved as impressions on two large archives of administrative tablets from Persepolis, the Persepolis Fortification archive (509-493 BC) and the Persepolis Treasury archive (492-457 BC). The glyptic imagery here published concerns representations of what have been traditionally termed “fire altars” and/or “fire temples.” Most of this glyptic evidence has never been published; many of the structures and the scenes in which they occur are strikingly original. The goals of this study are to introduce a new corpus of visual imagery concerning religious ritual in the Achaemenid period and to explore the significance of this visual language for our understanding of ritual traditions emerging within the heart of the empire at its most critical formative period, the reign of Darius I. This study seeks also to use the Persepolitan glyptic evidence as a springboard to re-visit the most famous “fire altar” depicted in Achaemenid art, that on the tomb relief of Darius I at Naqs-e Rostam. This study is an initial step in the development of a religious topography for the zone encompassing Persepolis and Naqs-e Rostam, both a topography on the imaginary level (through images) and a topography on the physical level (through the built space). The glyptic images assembled in this study are the most numerous, the most visually complex, and the best dated and contextualized evidence that currently exists for the study of fire in ritual, and religious ritual more broadly, in early Achaemenid Iran. You can download and read this volume here.